If you live in a state with all four seasons, you likely have a love-hate relationship with the heat. During brutal winters, it’s easy to long for the days when you won’t have to wear multiple layers. But then those scorching summer days hit — and so does the sweat — and you start to realize cold weather isn’t all that bad. This week, we have an app that will help you find the right balance between hot and cold. It’s Cool — currently only available for iOS — is a weather alarm meant specifically to notify you when the weather is nice. In the App Store, the developer explained the idea was born from spending too many summer days and nights inside. With temperatures sky-rocketing, we don’t often realize how much time we spend sitting in air conditioned spaces to shelter us from the heat. Warm seasons are meant to be spent outside, and a weather alarm could be just the push we need to keep us from getting summer cabin fever. This app is simple to use and doesn’t have much to its interface. 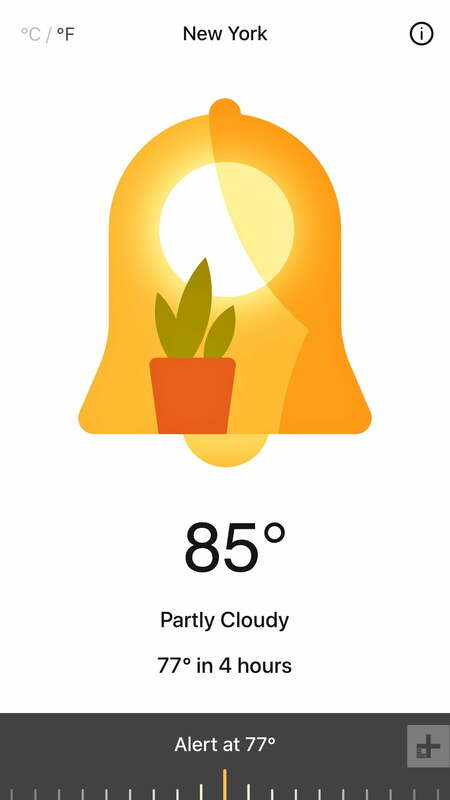 Upon downloading it, you’re greeted by an animated bell with a plant inside and a sun hovering over it. 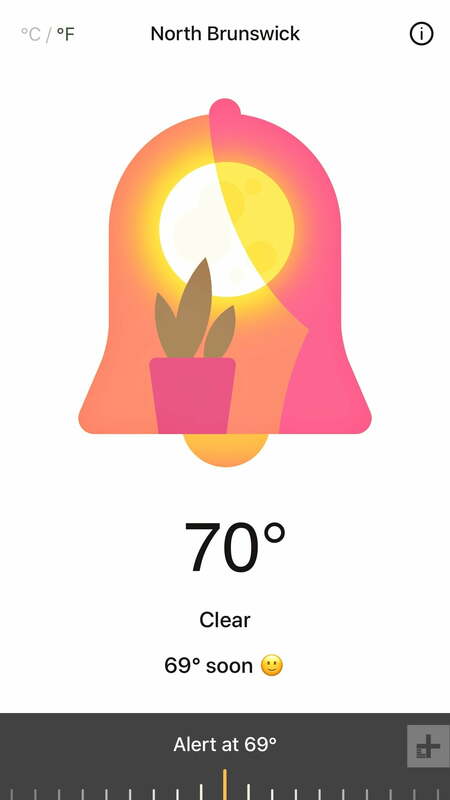 Above the bell is the city or town you’re in and to the left of it you have the option of setting the temperature at either Fahrenheit or Celsius. On the bottom is where you see the current temperature, a description of the current weather, and how many hours until it reaches your preferred temperature outside. The dial at the bottom lets you easily slide back and forth between the temperatures. Once you’ve stopped at your desired temperature, it will automatically set an alarm to notify you later. Underneath the set temperature, the app also lets you know how many hours it will take to reach it. When I first tried out it out, the temperature in New York City was 85 degrees and partly cloudy. I set the dial to alert me at 84 degrees which said it would take two hours. But after two hours went by, the temperature went down and I didn’t get an alert. Then, I tried again by bringing it down to 77 degrees which said it would take four hours before alerting me. Even after four hours, I still had zero notifications on my phone. After reading through the reviews on the App Store, I noticed that other users were posting the same complaint. It’s clear the developer — TinRocket — was well aware, because after a brief Twitter direct message exchange I was guided to a support article dedicated to the exact same problem. In the beginning, you’re asked for permission to use location information, access to background data, and permission to send push notifications. If you want to use the app to its fullest extent, make sure tap allow for all of them. If you tap don’t allow by accident, you can always go to Settings and scroll down to the It’s Cool app. There, you’ll have to turn the location on to While Using in order to find the local weather. Then, toggle Background App Refresh on to allow the app to check the weather periodically. 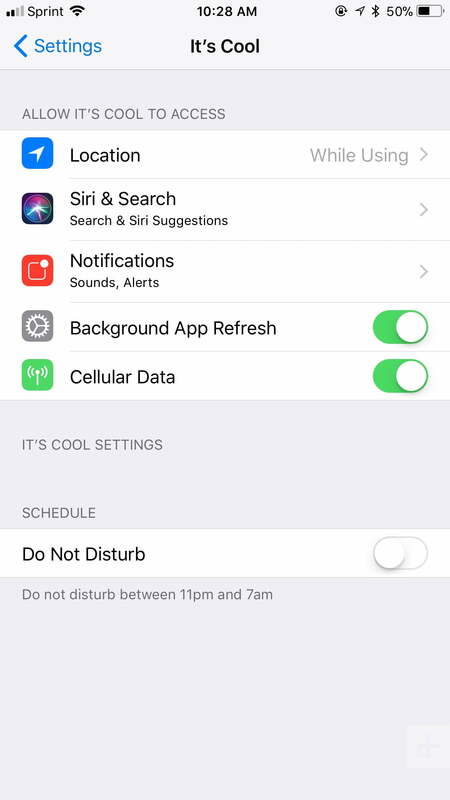 If you want to receive notifications between the hours of 11 PM and 7 PM, toggle off Do Not Disturb mode. After fixing the settings, I started receiving notifications to my phone. When the outdoors reached 68 degrees, I saw a push notification that read exactly that. Some could argue you could easily step outside and check the weather, or even simply open a window. But since it did take a few hours, I forgot that I was even waiting for the temperature to drop since I was focused on other tasks. Even though we tell ourselves we’ll go outside once it gets cooler, it’s more likely we’ll be too buried in our phones to remember. That’s where the handy-dandy notification comes in. While summer is coming to an end, temperatures in September still remain high — you technically have one more month to make up for staying indoors these past few months. Even if you don’t plan on using it to go outside, the app could help lower those AC bills.